Last week, two bottles of 60-year-old, 1926 Macallan single malt sold for more than US$1m at auction in Hong Kong. What’s so special about this whisky – and what does it say about the current, feverish state of the collectors’ market? Richard Woodard reports. Millionaire malts: But how long will the 1926 Macallan record last in the current climate? The bidding is finished; the room falls silent. On the screen, a series of numbers glow… ‘HKD: 6,500,000; GBP: 614,000; USD: 828,000.’ With the addition of a 22.5% buyer’s premium, a telephone bidder has just become the first person to spend US$1m at auction on a bottle of whisky: Macallan 1926, 60-Year-Old, Peter Blake edition. A few hours later, the gavel falls again. Another 60-year-old Macallan distilled in 1926 is auctioned, this time with a label designed by Valerio Adami. The numbers light up once more… ‘HKD: 7,050,000.’ The final sum paid by a bidder in the saleroom: US$1.1m. Primarily a blender’s malt, Macallan is popular in the Speyside area, but not well-known beyond its borders. A small team at the distillery – Allan and Peter Shiach, managing director Willie Phillips – is determined to change all that. They bring in Hugh Mitcalfe, previously with Glen Grant, who has heard tales of the wonderful stocks of single malt lurking in the Macallan warehouses. He’s a little sceptical – until he sees the inventory. ‘He was over the moon,’ recalls Phillips, who spent 18 years at Macallan and is now chairman of Ardgowan, the Lowland distillery planned for Inverkip, west of Glasgow. The Macallan team starts slowly, marrying a 25-year-old that becomes the Anniversary Malt. ‘And then Hugh said: “I wonder if we could go to 50? Have you stock of 50?”’ Phillips continues. ‘I said, I know I have stock of 50, but whether it’s of Macallan quality to go into bottle, we’ll have to see. Anyway, we did. ‘In the course of going through that, he noticed this cask of 1926, 60-year-old. Again, it was the same problem: is the whisky worth bottling? Cask no 263 was an ex-Sherry hogshead, yielding 40 bottles at a strength of 42.6% abv. Now thoughts turned to the packaging. Someone – Phillips is unsure now whether it was Peter Shiach or Macallan’s advertising agency – knew the renowned pop artist Peter Blake, and he was persuaded to design a label. The result will be familiar to anyone who knows Blake’s work – most famously, his design for The Beatles’ Sgt Pepper’s Lonely Hearts Club Band album cover in 1967. The Macallan label teems with topical references to events from 1926: the death of actor Rudolph Valentino, an assassination attempt on Italian dictator Benito Mussolini, the feats of US golfer Bobby Jones. In all, 12 Peter Blake bottles were created, hand-signed by the artist. Now fast-forward to 1993. ‘Armando Giovinetti [Macallan’s Italian distributor] thought: I can get an Italian artist to do the same if you have enough whisky,’ recalls Phillips. Graphic artist Valerio Adami was commissioned; 12 more bottles resulted. Here the mists of history and uncertain memory begin to cloud the facts. Phillips is convinced that the two sets of 12 were sold – ‘someone asked me the other day if I had one and I had to say no, I couldn’t afford it because we sold them for something like £15,000’ – but auction house Bonhams reckons that at least some were given away by Macallan to top clients and collectors. Of the 40 bottles drawn from cask 263, that left 16. Two were sold – in blank bottles with the buyers invited to design their own labels – at auction in 2001 and 2002, fetching record hammer prices of £15,000 and £18,000 respectively. Others were offered by Macallan as part of its roster of Vintage Macallan releases in 2003, priced at £20,000 a bottle. Over the years, the hyperbole surrounding the Blake and Adami bottles has grown, fuelled by their scarcity. Some, it seems, were opened and consumed, but how many? Is it true that a set was destroyed in the earthquake that hit Japan in 2011? 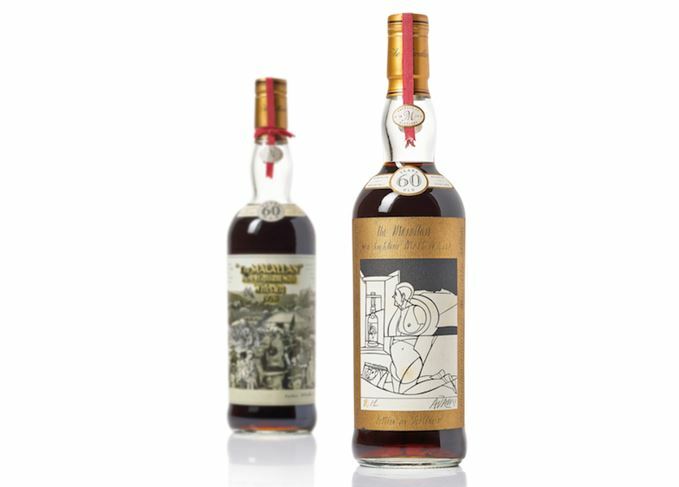 The pair auctioned by Bonhams last week had been unseen in public, according to the auction house’s pre-sale publicity, ‘since they were auctioned over three decades ago in the 1980s’ – which seems unlikely, given that the Adami bottles were only released in 1993. What do we know for sure? According to the first edition of The Definitive Guide to Buying Vintage Macallan, published in 2003, a Macallan 1926 Peter Blake was auctioned in Glasgow in 1991 for £6,375; five years later, an Adami sold in London for £12,000 (both hammer prices). Move on a decade or so, and a single bottle of the Adami edition was auctioned by Christie’s for US$75,000. Then the trail goes cold… until this year. Remarkably, no fewer than five bottles – three Blake, two Adami – have surfaced in 2018. First, Dubai Airport retailer Le Clos sold a pair for US$600,000 each to an international businessman; then came the Bonhams sale; and now Sotheby’s has announced that it will auction a Peter Blake edition this autumn in New York, with a conservative-looking pre-sale estimate of US$500,000-700,000. These collectors are after the likes of Port Ellen and Dalmore; Karuizawa, Hanyu and Yamazaki. A bottle of Karuizawa 1960, 52-Year-Old ‘The Dragon’ fetched HK$2.45m/US$312,130 at last Friday’s Bonhams sale, a record price for a single bottle of Japanese whisky at auction. The result is that whisky is out-performing even the most sought-after fine wine, Burgundy’s Domaine de la Romanée-Conti (DRC), which has appreciated by about 30% in the past year; over the same timescale, prices for Macallan aged 18 years and older have doubled, according to Lam. Meanwhile, Sotheby’s sold US$2.6m-worth of Macallan in 2017, including its two highest-grossing auction lots of the year. Total Macallan revenues were up 4,000%, lifting the single malt to number seven on the auction house’s top 10 producer list. Given this apparently unquenchable demand, is there something out there that might break the Bonhams record? Simpson is unsure. ‘Maybe a 1926 Macallan Fine & Rare bottle,’ he says. ‘And don’t write off Dalmore Trinitas – there are only three bottles in existence – but I think it’s a challenge. More than 30 years after he approved the bottling of the Blake editions, did Willie Phillips ever think that they would become million-dollar whiskies? He exhales sharply: ‘No, of course not. At the time, it was a marketing exercise. It was part and parcel of getting the name of Macallan known outside Speyside. In the week that Macallan opens its space-age, £140m super-distillery, and as its historic bottlings fetch dizzying sums halfway around the world, it’s worth remembering just how far into the past the roots of its success reach. Two bottles with labels designed by Sir Peter Blake and Valerio Adami were sold in Dubai.